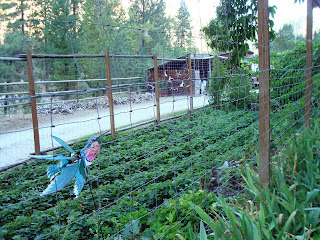 Squash House Quilts: Fishing, Stitching...and a Bear! Thanks to all of you on your good wishes for Mr. Squash and I on our 9th wedding anniversary! I'm sorry I didn't respond to each and every one of you, but we were away on our anniversary adventure! 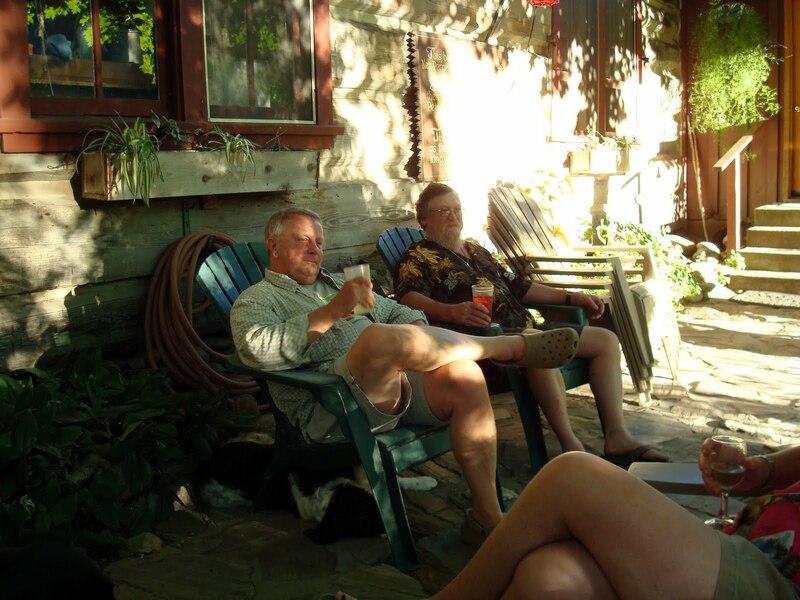 We returned home on Sunday after five great days in the wilderness at Shepp Ranch in Idaho! We took a lot of pictures and I've attempted to post some of the best. As always, you can click on a photo for a better look. 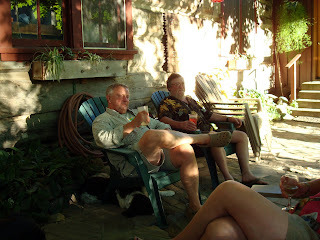 Mike and Lynn, our hosts, took us fishing the first day at one of our favorite spots on the Salmon River. This was the first time in four trips that Lynn was able to join us! Why, you ask? We were the only guests for the week! Talk about being treated like royalty! Here I am with my big catch of the day! 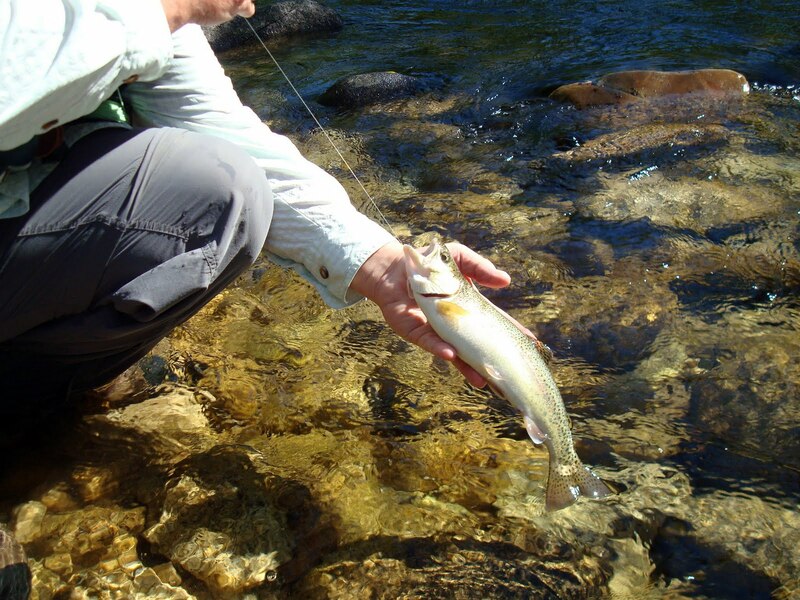 Another day, Mike took us up Crooked Creek --- I caught this really nice Rainbow trout in one of the great holes on the creek! 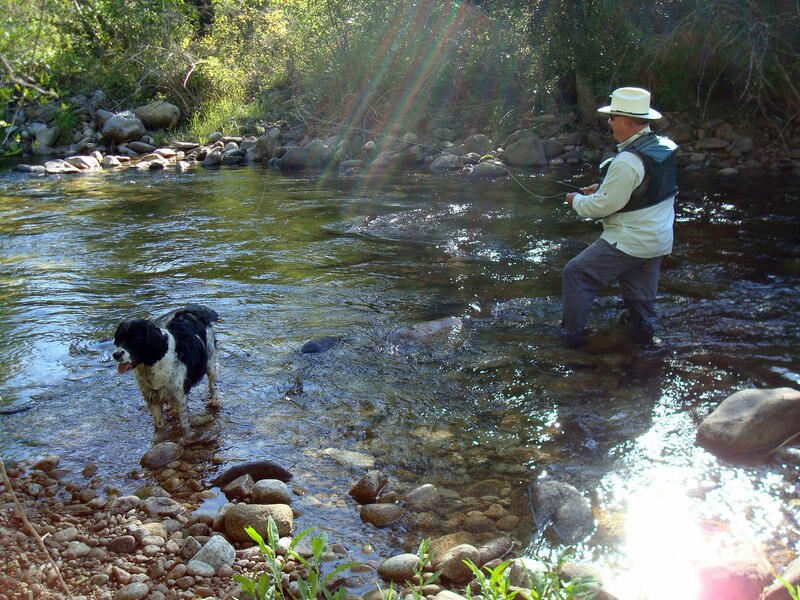 Here Mike is explaining where to cast so that I might catch "Mo" - the legendary trout that lives in this spot! Unfortunately, Mo was not interested in anything I presented to him. Mr. 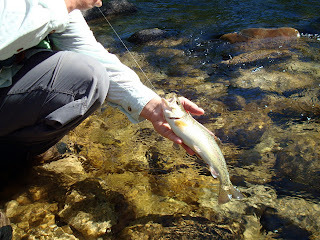 Squash really outdid himself this trip - he caught several, large Cutthroat trout! Here is just one of them! Here he is with Connie, one of the ranch dogs, on Crooked Creek, casting into a sunbeam! I also had time for some stitching out on our deck! The weather was gorgeous - hot days and cool nights! 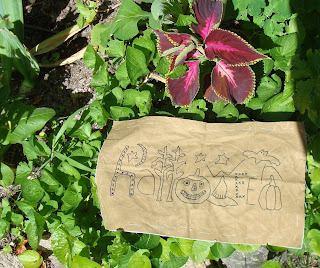 This will be a pillow --- a fun little stitchery from Buttermilk Basin! 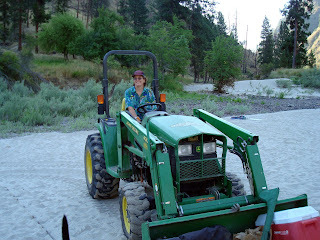 Here is Lynn on her tractor. She came down to the river to haul our stuff up to the cabin! What a woman - tractor lady, fisherwoman, great chef, gardener, horsewoman and wonderful friend! Sorry if I left any of your great attributes out, Lynn! Mr. Squash had some issues with his back on this trip. Turns out Mike also has the same issue! Here they are discussing their aches and pains before dinner one evening! 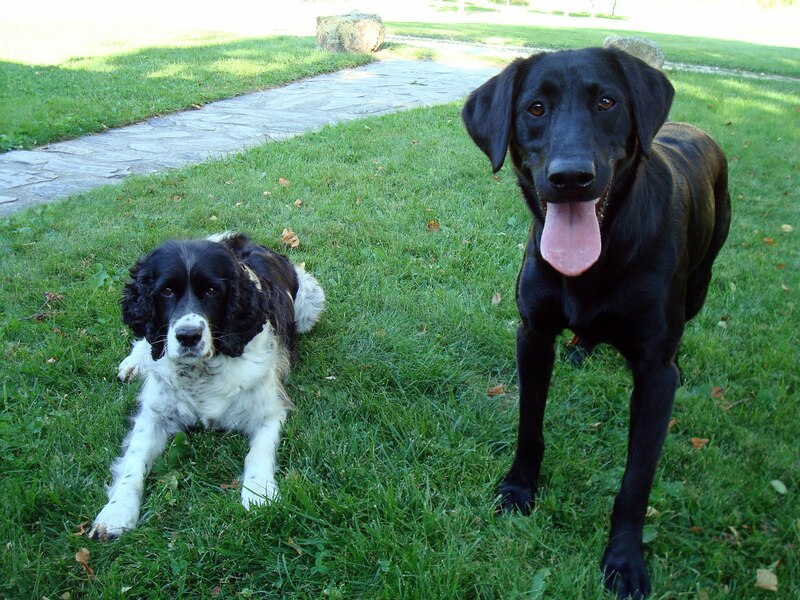 Connie on the left has been our fishing buddy for the last three trips to the ranch! She was joined this year by Coot - the most wonderful, two year old black lab! She has incredible, expressive eyes and was eager to fetch anything in sight - including little scraps of grass she would find in the jet boat and place on my lap! Oh yeah - the bear! There were several on this trip! Charles, the chef, was telling us about a family of four that lived up on Crooked Creek this year. We saw lots of evidence of them while fishing up there, and on the last outing, we actually saw one of them across the river! That was enough to pack it in for the day! This bear we spotted on the road out at the end of our trip. We were able to get right up to him (in the car, of course). All he was interested in were the berries on the side of the road - and thankfully not us! 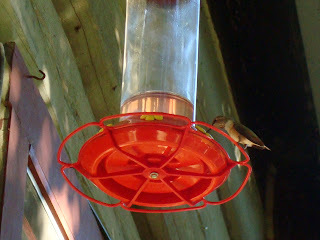 The Hummingbirds at the ranch are numerous and quite tame! This was the first time I ever saw one sit on a feeder without flapping its wings! 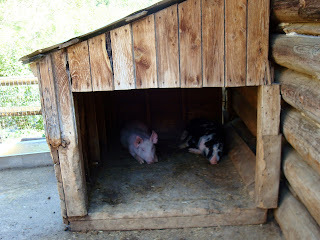 Then there are the pigs....they were trying to stay cool here in their little house. I tried to get a picture of Florence the cow, but she was hiding in her little barn out of the heat as well. She's responsible for all the fresh milk and butter at each meal! 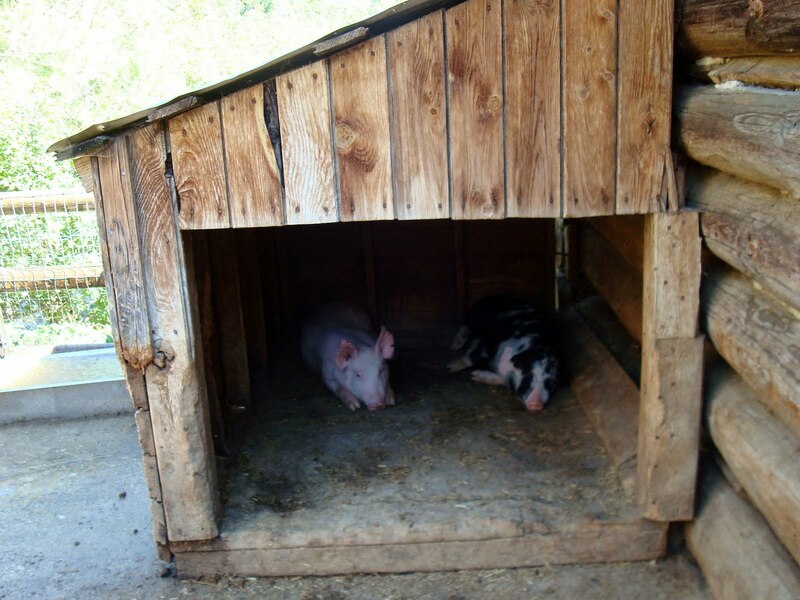 Other animals on the ranch are donkeys, horses and cats! One evening Mike and Lynn had to chase Itchy the donkey back to his paddock. Charles explained he's a jumper and that night he decided the apples in the orchard looked really good to him! Mike is very organized around the ranch. 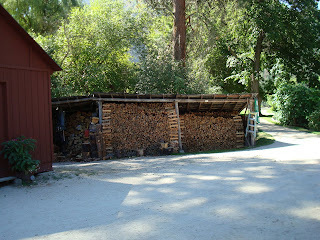 I'm always impressed at how nicely he cuts and stacks the firewood! 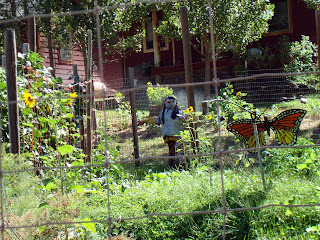 Here is part of the vegetable garden - and who might that lovely lady be in there guarding all the fresh veggies from predators? 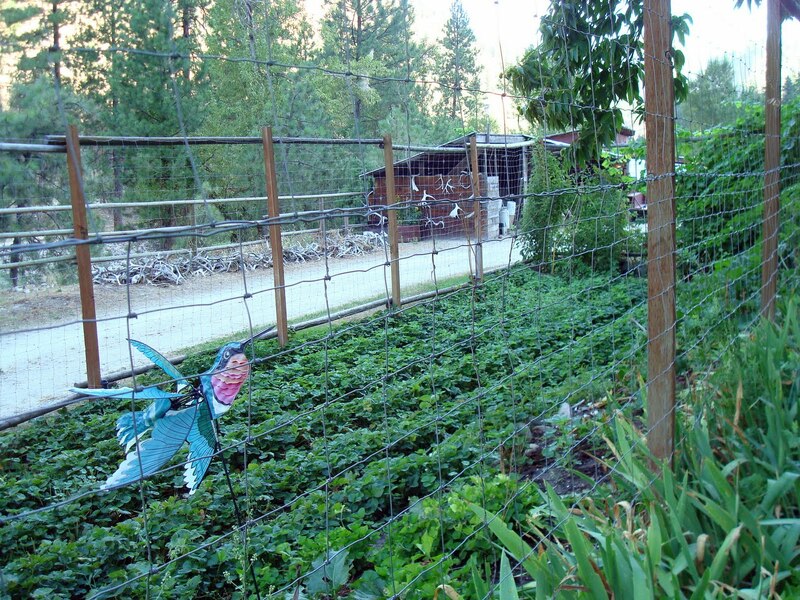 This is the strawberry patch - surrounded by a tall, wire fence to keep out deer (also in the vegetable garden)! There are also grapes growing up the other end of the fence! I wish I could show you all the pictures! 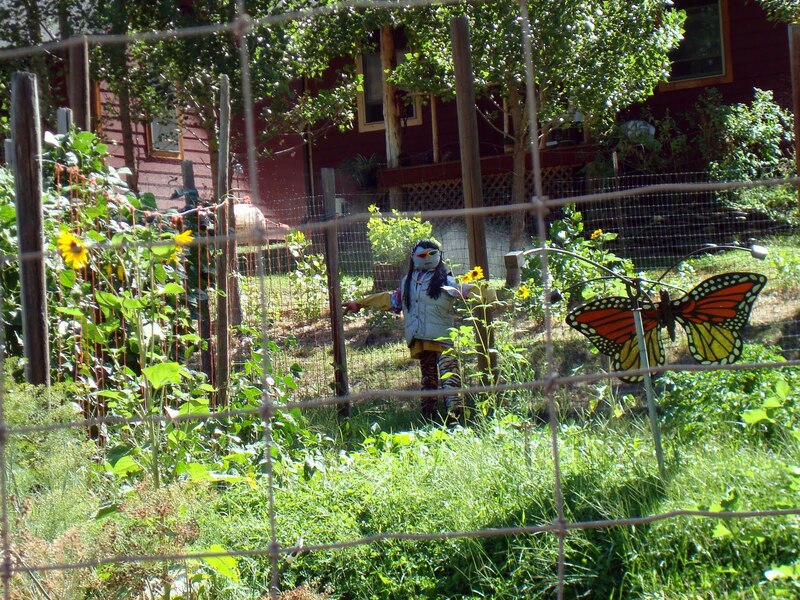 This gives you just a little idea of what a delightful place Shepp Ranch is! We plan to return next year for a little Steelhead fishing! Welcome back! Your trip sounds adventurous and exciting. How nice that you both caught some fish there. I wouldn't like to meet any bears. -The stitching is cute. I thoroughly enjoyed the photos. It's so wonderful seeing parts of this country that one doesn't get to visit. Thank you, Candace. It just looks so relaxing and laid back. However I'm sure the hosts have alot to keep them busy with the animals, gardens, etc. What a beautiful place. Wonderful pictures. What a great recap of your trip, you tell a wonderful story with your photos, Looks like a great getaway spot! RELAXING trip. Now back to reality. I love the sunbeam photo and the guys discussing their ails. That's a very amazing and very self-sufficient looking ranch. I'll just bet the meals were outstanding. Wow, what a wonderful place to spend an anniversary...or anything for that matter. Looks so relaxing. And to know that you were the only guests, now that's a real treat. Happy 9th to you both! Welcome Home! This ranch looks like a wonderful vacation spot! Enjoyed all the photos you shared!! I have fishing envy. It looks wonderful! Glad you had fun! What a great place. I'm so glad you had fun. It is good to catch up with you. We've both been on vacation. And fishing, too. Well, my son and BIL. We had the best fresh trout Friday. Wowie. Amazing photos of your trip, Candace. It certainly looks like a little piece of heaven on earth. As you know, I'm not a fisherman/woman but I sure can picture myself in such beautiful scenery (without the bear, of course). It looks like a fantastic place to be and a fantastic time away! Candace, Thanks so much for your kind words and great pictures! We enjoyed having you. I wore my new apron last night and Cheyenne says it is very flattering on me! and it worked like a charm. Wore it one way for cooking and turned it over for serving! thanks so much for it! Mike is feeling better today, I hope Bob is too! You look like you are having such a great time and who wouldn't in that setting. Some good catches. Mike sure is prepared for winter with all that wood. Hummingbirds are so cool to watch. I have feeders for them here. Sorry to hear the guy's backs were not cooperating. 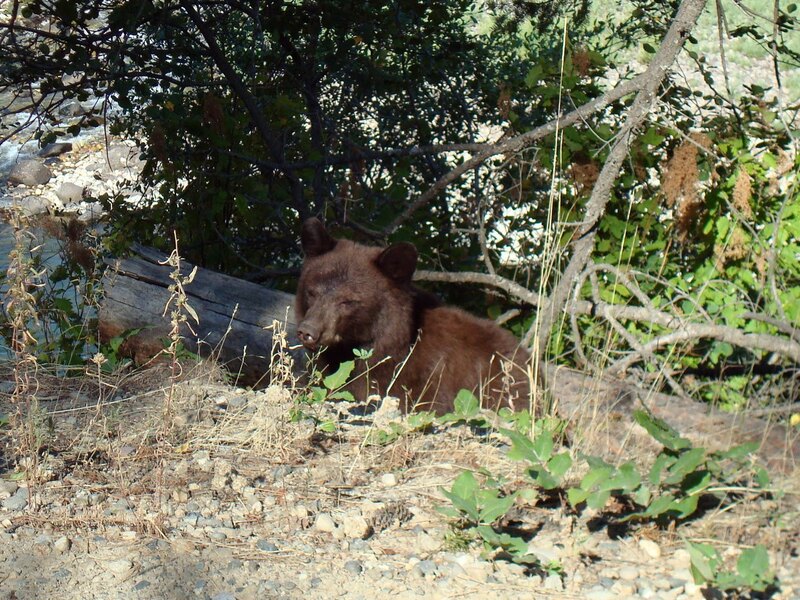 Cool picture of the bear and the one with the sun rays shining. What a relaxing and beautiful place. Glad you enjoyed yourselves.